This image shows the misfit scales found on the lantern of the Photuris firefly. Researchers found that the sharp edges of the scales let out the most light. Credit: Optics Express. The nighttime twinkling of fireflies has inspired scientists to modify a light-emitting diode (LED) so it is more than one and a half times as efficient as the original. Researchers from Belgium, France, and Canada studied the internal structure of firefly lanterns, the organs on the bioluminescent insects’ abdomens that flash to attract mates. The scientists identified an unexpected pattern of jagged scales that enhanced the lanterns’ glow, and applied that knowledge to LED design to create an LED overlayer that mimicked the natural structure. The overlayer, which increased LED light extraction by up to 55 percent, could be easily tailored to existing diode designs to help humans light up the night while using less energy. The work is published in a pair of papers today in the Optical Society’s (OSA) open-access journal Optics Express. Fireflies create light through a chemical reaction that takes place in specialized cells called photocytes. The light is emitted through a part of the insect’s exoskeleton called the cuticle. Light travels through the cuticle more slowly than it travels through air, and the mismatch means a proportion of the light is reflected back into the lantern, dimming the glow. 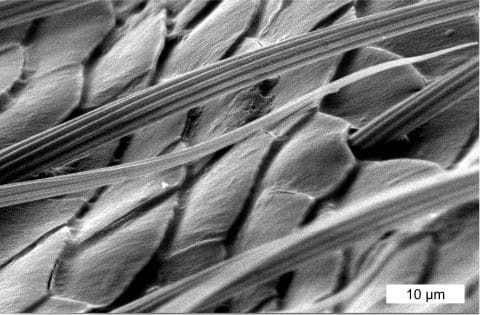 The unique surface geometry of some fireflies’ cuticles, however, can help minimize internal reflections, meaning more light escapes to reachthe eyes of potential firefly suitors.